The Pineapple is a tropical plant with edible multiple fruit consisting of coalesced berries,and the most economically significant plant in the Bromeliaceae family. Pineapples may be cultivated from a crown cutting of the fruit, possibly flowering in 20–24 months and fruiting in the following six months. Pineapple does not ripen significantly post-harvest. 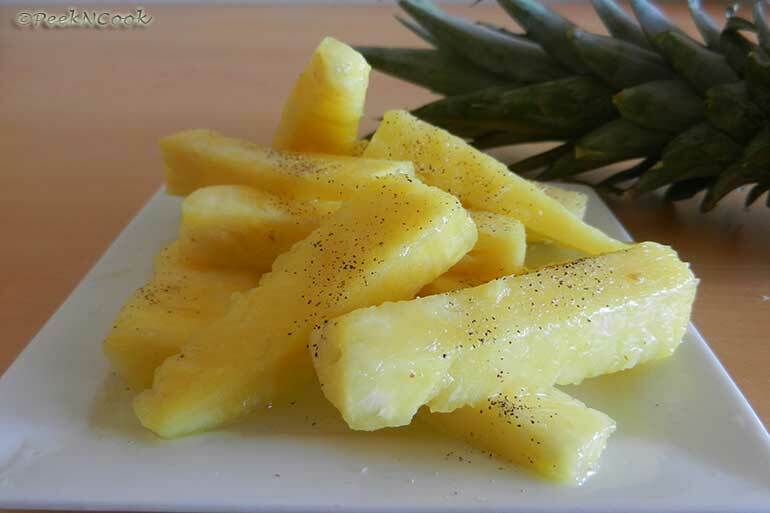 Pineapple blast is a very easy and Chat pata recipe recipe to make. Very healthy too. Recently I've got a huge hamper from Ciba spices, with lots of spice powder including 'Chaat Masala'. So when I thought of giving a makeover to this old blog post with some new photos, I've decided to use their 'Chaat Masala', which has amazing Chatpata taste, which made this 'Pineapple Blast' even tastier. And I do recommend their 'Chaat Masala' for any kind of chaats. As chaat masala can't be made at home, so I use to buy it from outside, I've already used many leading brand. But this brand really nice and tangy spicy taste with it, which will give your taste buzz a tingle seance. Take a bowl and put the pineapple strips into it. Then sprinkle all the ingredients listwise one by one. Cover the bowl and place it in the refrigerator for 2 hours. After 2 hours remove it from the refrigerator and serve it.